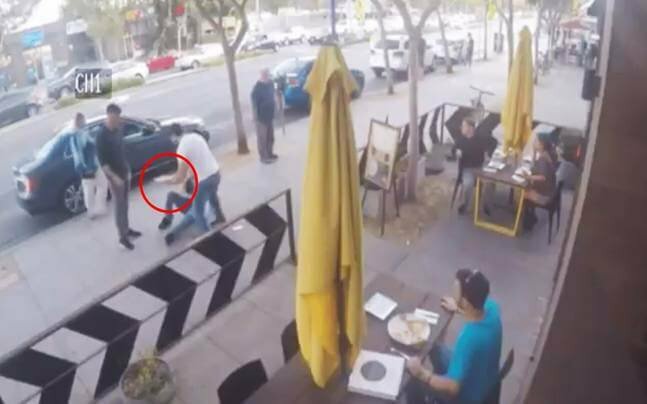 Everyone Needs To Watch This CCTV Footage Of One Guy Stopping A Street Fight Using A Pizza! Whether you're celebrating a victory or you're not in the mood to prepare dinner, pizza is what comes to everyone's rescue. And rightly so, since in times of crisis, all we need is a box of cheese burst pizza and everything else falls into place. Don't believe me? Here's one crazy incident that will make you fall in love with pizza all over again. A CCTV camera captured some footage of two men fighting alongside a footpath when a waiter came from inside and stopped the brawl with the help of...wait...for...it...a PIZZA. @_Psycho_dad_ If I fight PizzaMan will another Pizza Man appear to give us all a slice? Can we abuse recursive PizzaMen to end world hunger? @_Psycho_dad_ @rob_bieber ah I get it. Make Pizza not war. @_Psycho_dad_ @junglefruits Now that's a super power. I have to say, these two got pretty emotional. @_Psycho_dad_ @ShrenikGopani Let's go fight outside @JoeysPizza. All's well that ends with pizza.